The latest from Mowat in our ongoing Shifting Gears research partnership with KPMG, this study looks at the growing global trend toward outcomes-based program funding. In an era marked by fiscal restraint and rising expectations for accountability and effectiveness, governments increasingly are looking to maximize the impact of social programs. The study provides key recommendations for governments to realize the potential of outcomes-based funding. We are now in the midst of an exciting period of innovation in the way public services are funded. Governments have traditionally invested billions of dollars in social support systems with little understanding of their actual social impact. At best, programs and services have been funded, and their effectiveness measured, on the basis of input or activity-based indicators. This is beginning to change. Governments around the globe are increasingly interested in paying for services through outcomes-based funding—a catch-all term for a variety of contracting arrangements whereby governments financially reward providers (and sometimes private investors) for having a positive, measureable impact on the lives of service users. The motivation for moving in this direction is understandable: in today’s tight budgetary environment, governments are under increasing pressure to ensure that limited financial resources are allocated effectively. By paying for outcomes, public sector leaders aim to enhance accountability and achieve greater social impact by redirecting funds to high-performing service providers. Outcomes funding is already well-established in some program areas, such as welfare-to-work schemes. This report addresses the challenges that governments now face in extending the use of outcomes funding to highly complex delivery areas, such as criminal justice and child and family welfare. It identifies key obstacles to implementation that result from the specific institutional context within which governments are operating and it makes a series of recommendations for how these problems might be overcome. Outcomes funding arrangements rely on governments being able to measure the alleviation of social problems. Yet this task is made a great deal more difficult by long-term under-investment in impact evaluation. There is limited support infrastructure—including data collection systems, data sharing arrangements and evaluation specialists—to facilitate the roll out of outcomes funding. The resulting absence of baseline information makes it difficult to assess whether outcomes funding (as one payment system among many options) has a positive impact on service delivery. While outcomes funding is often celebrated as a vehicle for promoting innovation, the reality is that both service delivery providers and funders need assurances on the achievability of outcomes targets. The quality and availability of existing evidence on effective interventions plays a significant role. However, the evidence base available to governments, investors and service delivery organizations alike is patchy. It tends to be stronger in program areas with a tradition of rigorous evaluation (e.g. health) or where outcomes funding is more established (e.g. welfare-to-work). But the evidence base is weak in many of the areas that governments are now trying to extend outcomes funding, including integrated family support services and early years intervention. Even in program areas where rigorous impact evaluation has taken place, it is not always readily available to stakeholders involved in outcomes funding arrangements. Outcomes funding will only be effective if the incentives facing all stakeholder groups—government, service delivery organizations, investors and clients—are aligned. Yet all too often there is a high risk of over-payment, gaming and non-cooperation because governments introduce outcomes funding into poorly-coordinated social support systems, where provider capacity is low, trust is lacking, and risk is unevenly distributed. Before rolling out outcomes funding, governments need clarity around existing expenditure and program performance. Time should be spent mapping current spending, clarifying program objectives, identifying clearly defined target populations, and evaluating the impact of existing services. Governments must mine current administrative systems, facilitate data sharing, address gaps in data collection and engage stakeholders. Only once baseline information is available will it be possible to award outcomes payments, help service providers recognize whether they need to adapt their practices to meet pay-for-success targets, and understand whether outcomes funding is an effective payment system across a range of program areas. Governments must invest in the support infrastructure needed to build capacity among both public servants and service delivery organizations. Independent “what works” institutes can play a valuable role in synthesizing and disseminating location-appropriate advice on proven interventions. Similarly, technical assistance labs can offer training, advice or analytics to support impact evaluation. In program areas that involve multiple agencies or levels of government in the direct funding or delivery of services, the success of outcomes funding depends on effective coordination. Necessary actions include the sharing of both financial information (to track spending) and service user data (to track the impact of services on clearly defined client populations). Stakeholder incentives must be aligned through such strategies as the creation of joint investment agreements (in situations where savings are dispersed and it is difficult for one agency or level of government to justify assuming sole responsibility for outcomes payments). Equally, coordinated procurement and monitoring will reduce the risk of over-payment to service providers. Outcomes funding has enormous potential, but there are also risks if implemented improperly. But this potential can only be realized with the existence of an enabling environment. 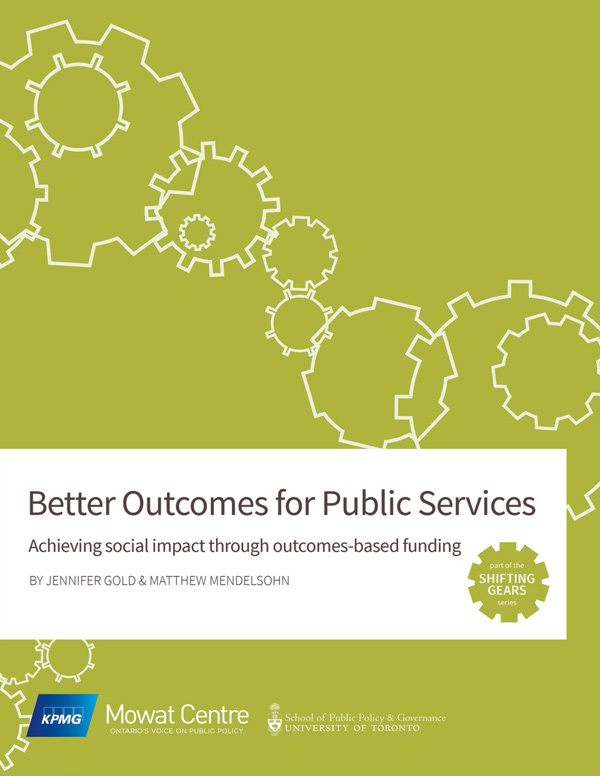 In identifying key implementation requirements and highlighting innovative practices already in use, Better Outcomes for Public Services offers a valuable resource for policymakers and practitioners seeking to achieve social impact through outcomes funding.